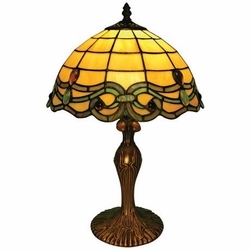 Make a stylish statement with this charming Tiffany-inspired table lamp. A sculpted base finished in antique bronze holds a Tiffany-style shade made from 184 cuts of glass and 16 cabochons soldered together. Add a new focal point to your decor with this beautiful table lamp. A distinctive look for side tables, buffets, and more. • Zinc and iron base.